A weekly dedicated its front page to letting people know it’s still in print after a rival title ceased publication on Wednesday. 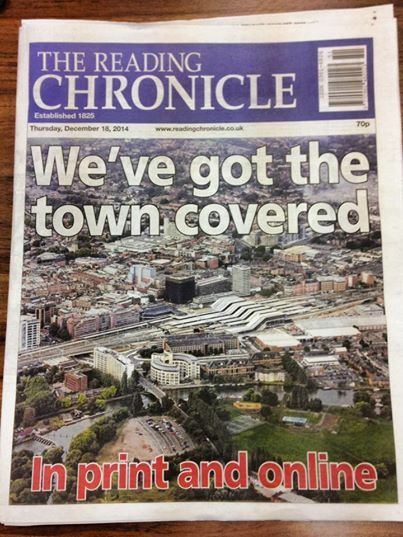 Thursday’s Reading Chronicle splashed on the headline ‘We’ve got the town covered’ accompanied by an aerial photo of Reading town centre and the subheading ‘In print and online’. Its publication came the day after the Reading Post’s last print edition hit the newsstands, to be replaced by a digital-only operation based around its companion website www.getreading.co.uk. Chronicle editor Lesley Potter explained the idea behind the front page, pictured below. She said: “We just wanted everybody in Reading to know that we’re still in print because I think it’s fair to say that people in Reading either bought the Post or the Chronicle, so people who bought the Post might not be aware of us. An editorial to that effect was run inside the paper along with a vox pop of readers asking them about the importance of printed newspapers, as well as interviews with local MPs and the Lord Lieutenant of Berkshire on the same subject. Councillor Tony Jones, Mayor of Reading, told the Chronicle: “I think it’s hugely important to have a printed newspaper in Reading. “People of all ages look forward to it and there’s something about being able to pick up and hold the newspaper instead of doing it all through your tablet or computer. The closure of the daily-turned-weekly Post, along with its sister title GetReading and five other newspapers across the south of England with the expected loss of 50 jobs, was announced by regional publisher Trinity Mirror last month. At the time, Lesley described the news as a “sad day for the people of Reading”, but also insisted the Chronicle was “not going anywhere”. Reading Chronicle Editor: ” I think it’s fair to say that people in Reading either bought the Post or the Chronicle, so people who bought the Post might not be aware of us. Clearly, if a substantial number of people in her town don’t realise there’s a local paper….it can’t be much of a paper and can’t be doing much to promote itself. Rather than wasting newsprint on a “puff” for itself, perhaps the paper might have run a really decent front page splash – rather than the almost impossible to understand tale of a bridge, assorted housing developments and a science park lumped together as a single story! But would you pick up that newspaper based on its front page? You only have to look at the circulation figures of the Chronicle to realise it might not be in the editor’s gift to say they aren’t going anywhere. I’d pick it up over its rival…. Oh dear….if the editor believes that people in the town don’t realise there is a local paper, it means the paper is pretty awful to the extent that people ignore it, and/or the paper’s promotion of itself has been dire. Perhaps the Reading Chronicle might have promoted itself rather better to potential customers if, instead of running the pointless wrap, it had featured a really good front page splash to attract new readers. Sadly, it had an almost impossible to understand complex tale of a bridge, assorted housing developments and a science park all crammed into a single and very lengthy article. Yawn! Don’t knock it, guys. That front page is a good response, especially for former readers of the Post who may be looking for a print option. I’d buy it (hmm…and how many reporters-with-iPhones or “citizen journos” could have taken that pic?). I don’t know what the paper’s like inside but somebody cares! “I think it’s fair to say that people in Reading either bought the Post or the Chronicle, so people who bought the Post might not be aware of us” – so that front page might have worked better as a paid-for advertisement in the final edition of the Reading Post. Now that the Post has gone, does that mean all of the papers started around the same time, ringing London, have now closed (or, at least ceased daily publication)? I like that bar code on the top right. Couldn’t it go on the back page? An “ear” used to be a much sought after spot on the front page. It’s a great idea giving all the noise about the paper closing. This way people who don’t follow every single bit of news and who may have just heard about the closure of the town’s paper, will clearly see they there is still an option in Reading. Newspaper’s live and die from the advertising they attract. Newspaper’s at their most base level are an advert for your website and should be treated as a cost. Pulling the paper just shows your advertiser you dont believe in the very thing you are trying to sell – The effectiveness of advertising.